Christinna Maldonado chose Matt and Melanie Capobianco to love, nurture, and raise her soon-to-be-born child. The Capobiancos had long wanted to be parents and after seven failed in vitro fertilization attempts, made the decision to enter into an â€œopen adoptionâ€ of Baby Veronica. On all accounts. Veronica was a happy, thriving, child residing in a stable, nurturing environment. To this day, Maldonado remains committed to her choice. On or around Jan. 4, 2010, Dusten Brown, the biological father, signed away custody of his daughter in exchange for not having financial responsibility. Brown later changed his mind and sought custody of Veronica. Initially, due to South Carolina law, he was denied standing because he was considered an absentee father. However, because he was 3/128th Cherokee heritage, the Cherokee Nation intervened in the adoption proceedings and argued that this happy, healthy two-year-old be transferred to Brown under the 1978 Indian Child Welfare Act. Baby Veronica, only 1.12% Cherokee heritage, was ordered removed from the Capobianco’s care and placed in Dusten Brownâ€™s custody. On Dec. 31, 2011, despite abundant evidence from child psychologists and attachment experts that removing toddlers from care-givers theyâ€™ve bonded to could cause long-lasting psychological damage, Veronica was handed over to her biological father. Though supporters of ICWA say it has safeguards to prevent misuse, Veronica and numerous other multi-racial children across the U.S have been hurt by it â€“ many of whom have never been near a reservation nor involved in tribal customs. Some opponents of ICWA question the motivation for seeking after children whose families have chosen to be disconnected from Indian Country. The Cherokee Nation alone had over 100 attorneys targeting some 1,500 children across the country in 2012. Now Veronicaâ€™s case has reached the highest level. On February 26, 2013, the Christian Alliance for Indian Child Welfare filed an amicus brief with the United States Supreme Court in support of Matt, Melanie and Veronica. SCOTUS will hear testimony of the case on April 16th and will make a ruling by the end of the term in June 2013. CAICW is asking the Supreme Court to reverse the decision made by the high court of South Carolina and return Baby Girl Veronica to the Capobiancos, family chosen for her by her birth-mother. The statutory and constitutional issues addressed in this case impact the equal protection, due process, liberty, and state rights provisions of children in need of care. A childâ€™s best interests should be considered in every child custody determination. There is no presumption that residing with members of a childâ€™s tribe is in the childâ€™s best interests, particularly when the child is lives off the tribeâ€™s reservation. Further, tribal governments lack inherent jurisdiction over nonmembers. Application of the federal ICWA to cases involving the parents who are not tribal members violates the equal protection provision of the U.S. constitution, even if a non-member parent lives within reservation boundaries. Then imagine if this had been your daughter, sister, or niece who had made the mistake of sleeping with a man who later refused to help with a child. Now pay attention. This man appeared to be Caucasian. So at some point he mentioned that he has Cherokee ancestry. However, in the time your daughter was with him, he never made an issue about being Indian, practiced anything traditional, or gave any cause to assume he was anything other than the myriad other Caucasians across the United States who claim to have Cherokee blood. Yes, those people of minute heritage who many tribal members of significant heritage mock as “wannabe” Indians. Now, imagine you and the rest of your family had supported her decision to move ahead with adoption and helped her find a good home for this child. Then imagine a tribal government coming in weeks, months or years later, and telling the courts that this man has 3/128th heritage, and based on this tiny bit of blood quantum, this man many tribal members would have mocked if it weren’t for Veronica – is now “Indian” and they are there to invalidate the decision your family had made. 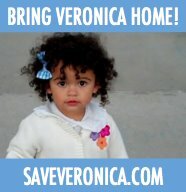 PLEASE REMEMBER TO PRAY NOW THROUGH TUESDAY – for Veronica, her parents, and all involved with this important decision. 12 users commented in " Baby Veronica’s rights, Women’s rights, and States Rights…vs Tribal Gov’t Tyranny "
Imagine, you have a son. The mother of his child conceals giving your grandchild away. Wouldn’t you do anything in your power to get your grandchild back? I would. P.S. the picture of Veronica in the paper this week with her real father was so sweet. She looked really happy. Dana, but keeping your grandchild is not your choice. This son chose not to be involved in this child’s life, and in fact signed away custody of his daughter in exchange for not having financial responsibility. When he did that, he signed away any rights you might have had as a grandparent. You lost standing to get the child. He signed away custody to the mother, not an adopted family. I think he regained custody of the child at 4 months old. The adoptive parents are potentially uprooting a toddler, not the other way around. Let’s not forget this was a private adoption and she was supplemented throughout and after the pregnancy. What does this say about wealthy white couples effectively buying babies from poor WOC? No – he did not regain custody when the child was 4 months old. I have worked closely with the adoptive mother since October, 2011, and I have communicated with the birth mother. Brown never even once asked to visit the child – which he would have been allowed to do if he wanted. The first time Veronica ever saw him was when he took her from the only parents she had ever lived with – when she was about 2 and a half. The adoptive parents took every step they were told to take by attorneys and the adoption agency to do this right. The ‘adoptive’ father was there to cut the cord at the birth, and the adoptive mother stayed in a room at the hospital to nurture the newborn. The bio father, who knew when the child was due, wasn’t there and never bothered to inquire about the birth. So it is patently false to say that the adoptive parents ‘uprooted’ anyone. Veronica was with THEM from the first moment. 1. The adoptive couple is not wealthy. 2. The adoptive couple did not buy the baby – but did go through an adoption agency. 3. The Hispanic birth mother is not ‘poor.’ She is working mom. Intelligent, hard-working, and a great mom with her older children. She chose the home she chose after careful consideration, knowing the birth father had said he wasn’t going to help support the baby. She has been broken-hearted for the last year over what has happened to her daughter – who she KNEW was happy in the home she had chosen. 4. The birth mom KNEW Veronica was happy because it was an open adoption and she and her other children did visit and know Veronica. 5. The birth father has not allowed the birth mother or her other children to visit or speak to Veronica at all during this last year, let alone let the adoptive parents speak to her as initially promised. 7. The child is not “Indian.” The child is 74% Caucasian, 25% Hispanic, and a tiny bit more than 1% Cherokee Nation. Further – it’s time to stop trying to label people by blood quantum. Children are children – and it is fact that any toddler torn from the only people she knows and loves WILL be hurt by it. You shouldn’t pick and choose which facts you “allow” to appear in your article. You have lost all credibility from me by dismissing the fact that the Father was deployed to serve in Iraq while the bio mom engaged an adoption without his knowledge or consent. If that were a fact, I would include it. But it isn’t. He wasn’t deployed until January – four months after Veronica was born. He was home, still not deployed, when he signed the papers to relinquish his rights as a parent. In January. Four months after she was born. He was deployed a few days later. Interesting. Thank you for the detailed response! There is a lot of contrary info out there. Very odd that it’s almost the opposite on most details -from the age of the child, to his Cherokee heritage. I’ll have to do some digging, such a shame that the truth isn’t clearer. I do take some issue with couples that use their relative wealth to obtain a baby. It’s not personal, it is a symptom of wealth inequality that people are uncomfortable acknowledging. The couple has the means to support the child, the birth mother does not. In a perfect world a child would not change hands over such an issue. Since the father did contest the adoption at 4 months when he was notified of it, I think it’s disingenuous to say he is responsible for her being uprooted as a toddler as a result of the ensuing custody battle. Your writing does leave me with a lot of concerns about how women may be prevented from placing their child up for adoption while simultaneously denied child support. Thank you for covering this and all your hard work in the pursuit of justice. Fusillisara – That is true; I agree. It would have been great if Christinna had felt she could handle Veronica. It should be noted that Matt & Melanie aren’t wealthy other than being 2 working parents with no other children rather than 1 parent with several. But yes – finances shouldn’t be an issue. My husband and I have been very, very low income at times in our lives. We found ways to cope with several children in our house with no money. My husband refused govt help – so we were poorer than many poor. We raised goats and chickens to help with costs, baked homemade bread, raised a garden, etc. It was a struggle, but one that was good for us and the children. But… we were also still two people rather than one. Even without money, at least we had each other to lean on. I know that sounds cliche – but I didn’t know how true it was until after my husband died of cancer. I didn’t realize at the time how significant it was to have two of us… to have a spouse to share all the hardships with. I wish now that I had realized back then how important it was to that we were a team. I would have expressed appreciation to him a whole lot better. Now – having to make decisions about the children and finances on my own for the last few years – is very different and very… unsettling much of the time. You never know if your decision is right because you have no one walking with you, seeing all the same factors you see, and being able to discuss all the various factors with you. Sure, I have good friends and relatives – but they aren’t living in this house. They don’t know the kids the way I do. They don’t know our history the way I do. They can make good and helpful comments – but it’s not the same. Nothing is the same as having a partner to talk to. So for me, even more significant than the financial aspect, is the spousal presence. If the US SC interprets the law in favor of the biological father in this circumstance (where the father claimed during the pregnancy to not want parental rights and did not file for paternity in any state for several months), a father who happens to be Indian is given all the rights, none of the responsibilities. He can tell the mother he won’t help at all with the child, but then block an adoption. In a different case, he could refuse custody, yet also refuse the non-Indian mother’s choice of adoptive parents. Basically, a father can play bait and switch. A father could even manipulate the situation to ensure he gets full custody. He could not disclose the Indian status, show extreme disinterest in the child, wait til the mother’s rights are terminated, then swoop in and get sole parental rights and full custody. And yes, I know a mother whose decision is only based on money could try to force the support issue in the courts – but she’ll have nothing while the case is ongoing, and depending on the father’s employment it can be a struggle to get the money even once a judge orders it. Remember, I speak as a birth mother – one of many in our org who do NOT want corrupt tribal govt to interfere with our families. Therefore, in our eyes, the Atlantic article gave a very biased report – embarrassingly pro-tribal govt and not necessarily accurate. They took their report primarily from our opponents. there is no doubt he paid nothing during the pregnancy and nothing at the time of the birth, right, to support the child or the mother? it; he just didn’t want to take any responsibility. And Thank you, rh1985! Very well said.